The Madison Grid tile takes simple elegance to a higher level. 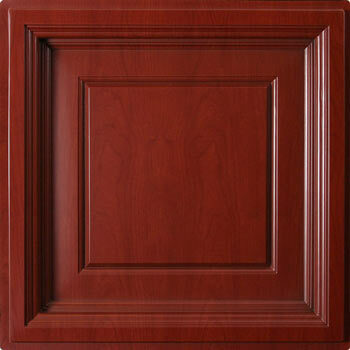 The deep coffered design will give your room a luxurious new feel that will be enjoyed by all. At .03" thick, it is twice as thick as our other grid tiles. 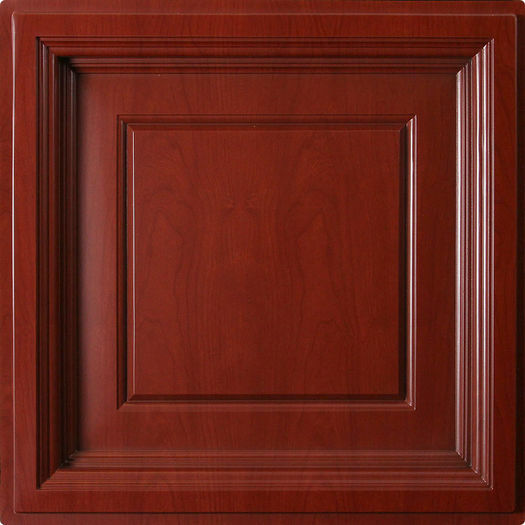 It is perfect for any area you want to add a little "wow". 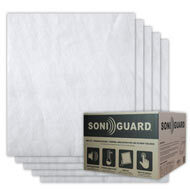 Being that it is Class A Fire rated, it is an excellent choice for most businesses and homes. We are also proud to say that it is made in the USA. 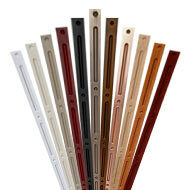 The Madison tile is designed for use in a drop ceiling only. 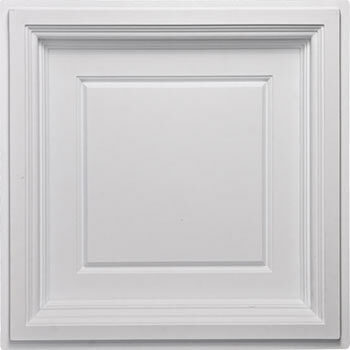 Since it isn't flat on the back, there isn't any surface area to directly attach it to your ceiling.The Madison tile recesses up into the grid 2 1/4"- That being said, you will want to make sure and plan accordingly to ensure there is enough room between the joists and the grid for to accommodate the tile, plus any existing fixtures, etc. Your ceiling will more than likely have partial tiles at the perimeter, you will have to cut the tiles to size for those areas. 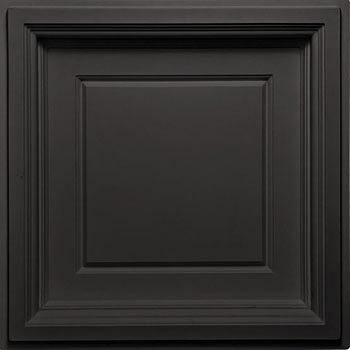 The dimensional qualities of the Madison do not make it suitable to be used as a partial tile. Not to worry, since we have the perfect solution. 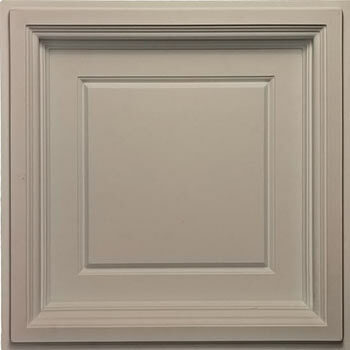 The Stratford tile mirrors the style of the Madison perfectly, and its flat design makes it the ideal border tile. 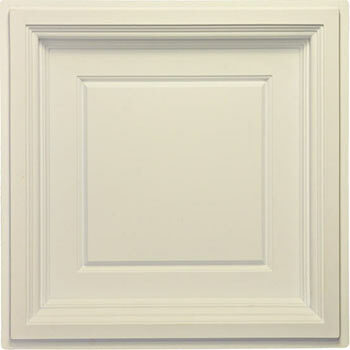 If your grid is already white and in good condition, it should match the white Madison tile very well. If you are going with a colored option, we highly recommend that you consider the Grid Tape or Grid Strips since they are color coordinated with the ProLite collection. If you would prefer to avoid the extra expense, you can of course paint your grid as well. Looks bette than I imagined everyone loves it. First of all service is great, product arrived quickly, the Madison tile has a rich classic look, it has completely transformed the room, I’m very pleased with the quality of the product. Very good product. Looks nice and gives you a impression that the ceiling its higher. Very Modern and clean look in our Restaurant! The ceiling is sometimes an after thought and when we were planning the renovation we originally were only going to do the walls and floor. I can't say enough for what this ceiling added to the overall feel of our restaurant. These tiles look just fabulous! Unlike other decorative drop in tiles you literally cannot tell it’s a drop in Rehab. My project was converting an dated kitchen recessed lighting box due to abandoning the old fluorescent fixtures and installing led recessed fixtures outside the box. This was by far the easiest way to provide an attractive solution for the now unused recessed ceiling box. The ceiling in this kitchen is only 7 ft so when you’re in the room you’re really close to the ceiling and still you can’t tell the original grid work is still there. I did have to trim the edges of the tiles about an 1/8 inch to get them to drop in but it was no big deal. They cut easily with scissors. 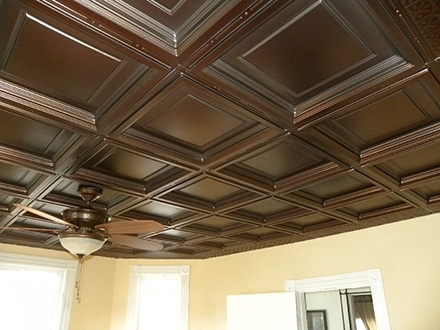 I did also use their grid strips which really made the project look just like a coffered ceiling. Like they say in the instructions make sure the raised dots on the strips are at the intersections of the grid. It makes a big difference in the final appearance. A good tip is if you’re using dark strips get a matching color marker and color a small section of grid where the strips intersect. That way you won’t see any tiny white lines from the white of the original strips. Our old space looks so sophisticated. They were very easy to install. Thank you for this new product. 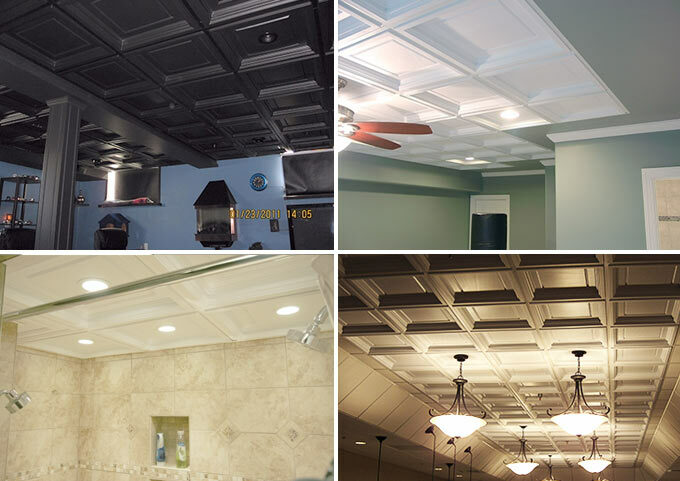 I outfitted two rooms using PRO Ceiling Tiles and I am confident of choosing the best company. Both shipments arrived the next day in perfect condition. The customer service folks I dealt with, both on the phone and online, offered exceptional help and expertise. If I could give them TEN stars, I would! Very nice looking. Shipping is supr fast. Had horrid-looking 4x2 oldtime panels that made the whole room look rather shabby. 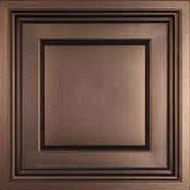 Using these recessed panels gave a sense of greater height to room and a classy look. And the whole room looks better. Product arrived as promised, no issues. Competivley priced! this was an excellent panel and will definitely buy again easy to cut and install light weight and looks great. However, if it has air flow through the area it may lift up like in a vestibule when the doors open suddenly but is easy to remedy by putting a weight above it. Guests all comment how unique and fantastic the ceiling looks. I have combined traditional gyproc with 6' x 6' sections of the coffered tiles. The tiles are about 4" higher than the gyproc ceiling. Looks fantastic but the tiles do have a plastic look to them. I might paint them to correct this. 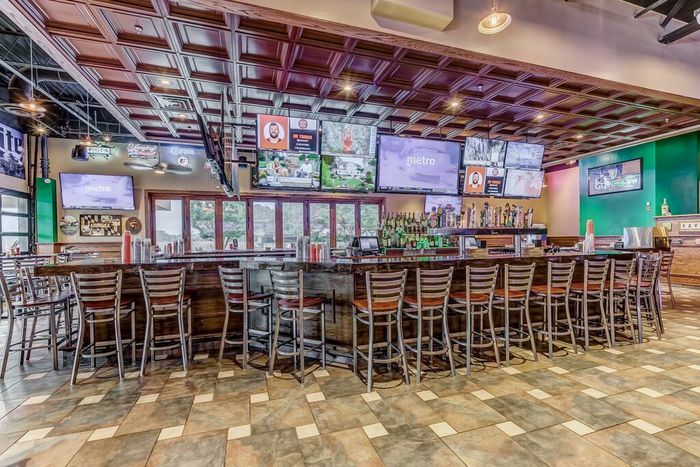 We have an older (2'x4') drop ceiling and a bunch of piping and wires above it, so other ceiling options either weren't an option or would have cost a fortune. These recessed tiles (with 2' grid dividers, turning it into a 2'x2') give visual height and look great. Room feels fresh and larger. Installed some can lights that give it a finished look. ProCeilingTiles.com was professional, courteous, and had good prices. I do not give five star reviews lightly. 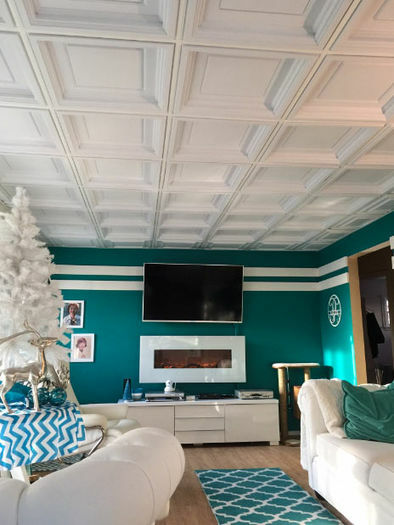 We remodeled our tv room and replaced the acoustic drop ceiling with 2' x 2' white Madison ceiling tiles which have about a 2.5" coffer. 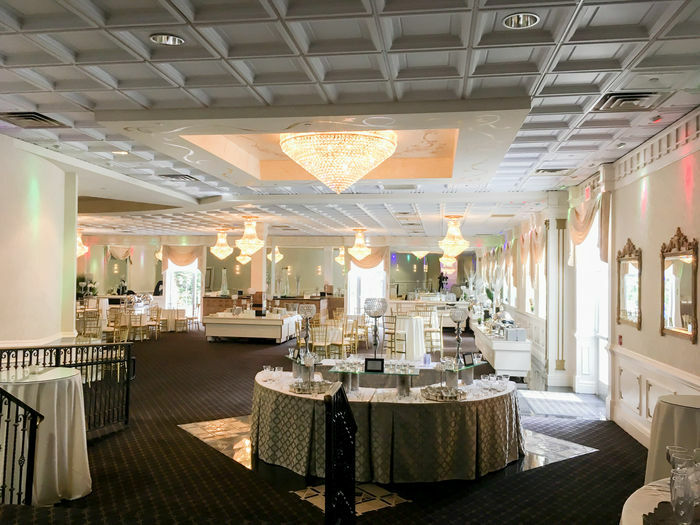 The resulting ceiling is very beautiful and dressy. It doesn't look like a basement room at all. In fact, the ceiling doesn't look like a drop ceiling. We've gotten many compliments and I couldn't be more pleased. 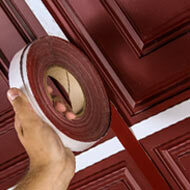 Thank you, Pro Ceiling Tiles, for a wonderful product that exceeded my expectations. looks great. easy to put up.